Lesson 16A - Forced landings, constant aspect method. As I set off for the airfield today there was no way I would be flying it was windy, low cloud and rainy, unlike the day before when my friend Simon had posted on Facebook a picture from our C42 of clear blue skies with a comment of “a beautiful day for flying…” what a difference 24 hours make! My lesson was scheduled to start at 12:00 and I walked through the clubhouse door just before, all the aeroplanes where in the hanger and the ground was wet with the path flooded in places, it had stopped raining and the cloud base had lifted probably to around 1,000ft. I sat in the club house with a cup of tea and Mike asked “what should we do today”, “drink tea” I replied adding “it’s too wet and windy and the cloud base is too low to fly” Mike agreed but added “as soon as the weather has moved through it should be ok!”. I raised a point that Katie, Pat and I had discussed the previous week about the damage you can do by rotating a Rotax engine backwards by hand and showed a Rotax bulletin which related to it (I will write a separate blog about this) the conversation moved on to forced landings and the various methods of approaching the fields. Mike teaches to plan the approach hitting certain heights at certain places; this has the advantage of making it feel almost like a normal landing. 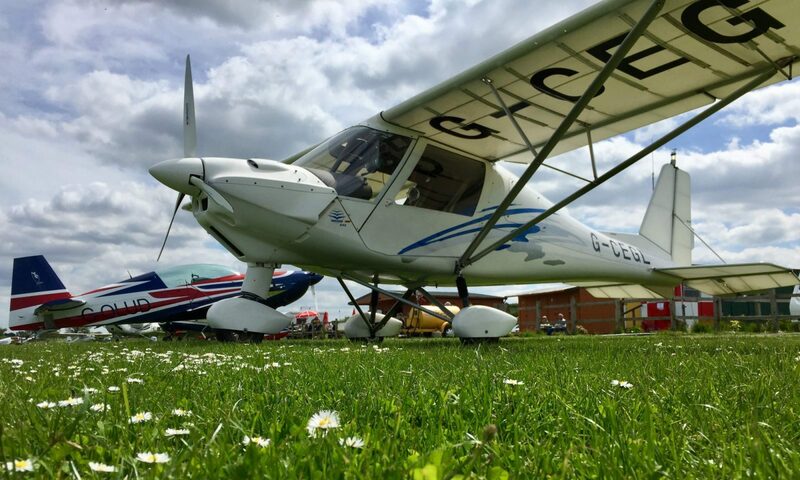 Then in the microlight book there is the beat and turn and constant aspect approaches to forced landings also. I had re read the book and wanted to know more about the constant aspect method, Mike obliged and drew out the principle on the white board. He added it is difficult to use this method in an unfamiliar aeroplane hence why he teaches the planned method. Mike is always happy to accommodate his students and as the weather had improved Mike suggested we go and try it and see how it works for me! As we sat warming the C42 up it started to rain again but this soon passed and we managed to get up to 2,500ft and still be clear of clouds, Mike demonstrated the constant Aspect approach with his normal precision, then it was my turn and I got it down too! The cloud base was dropping so we flew to a brighter area and I had another two goes each time reaching the intended field on my next attempt I was a little short, but not by much. Finding another area where we could reach 2,500ft I had another two goes including all the drills and reached the fields each time. As we returned to the airfield a shower was overhead and we flow through this and attempted another forced landing back on runway 19, but this time I would have overshot the field and we went around, I did find it distracting flying in rain previously I have only flown in very light showers! I flew a normal circuit in the rain which was lacking precision and height in places on final, but still managed to land nicely. We had been pre selecting fields before setting the engine to idle, but the method seemed to work for me and next time we are going to try it with Mike randomly calling engine failure! I think Katie’s tip in the comments on my last blog will help with the selection of a field also, so I’m looking forward to putting it all together. 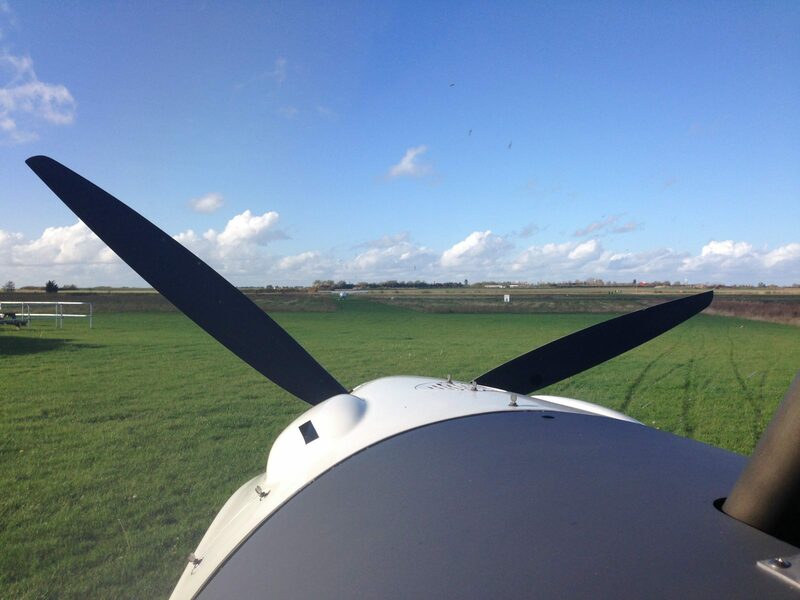 Select your Initial aiming point (IAP) while gliding along side your chosen field, or sooner if possible, and mentally note or picture the angle down to it with reference to the horizon, this is known as the Sight Line Angle (SLA). If this SLA begins to steepen then you are OVERSHOOTING your IAP. If the SLA begins to lessen then you are UNDERSHOOTING your IAP. you correct the IPA by moving closer or further away by making tighter or wider turns as needed. Back on the ground the weather had suddenly changed again and it was now a beautiful day, typical! Previous PostPrevious Engine failures – GST revision Part 2 of X!